Personalized Neck Totes -Custom Lanyard Pill Holders in Bulk. Promotional, Inexpensive. Green, Pink, Yellow, Orange, Blue, Red. Lowest prices in USA and Canada. Bulk waterproof, floating neck totes will keep your keys, money, jewelry, medication, I.D. safe and dry while Jogging, Skiing, Sailing, Swimming, Cycling, Sun Bathing, etc. 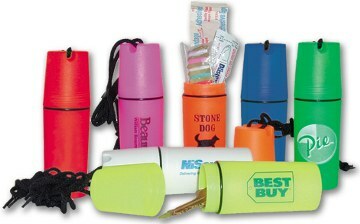 Budget Prices in the USA and Canada for wholesale personalized waterproof neck totes. American clients pay no taxes. Free artwork design. We will send you a proof for your approval before production. Prices include 1-color imprint. Add $0.25 per pill holder, for each extra imprint color. Call for pricing of blank pill holders. Extra color: add $0.25 per pill holder, per extra color. Production: 7-10 days after artwork approval. Contact us for faster delivery. Imprint Size: 1-3/4" x 7/8"